Observe that I added [parent] and [vinibaggio/my-subproject] to the commit titles, manually, just to improve visibility of where these commits are coming from. No changes were done to my-subproject. See those -n 1…5 lines? This is git going through the commits and picking the changes that should go to the repo. 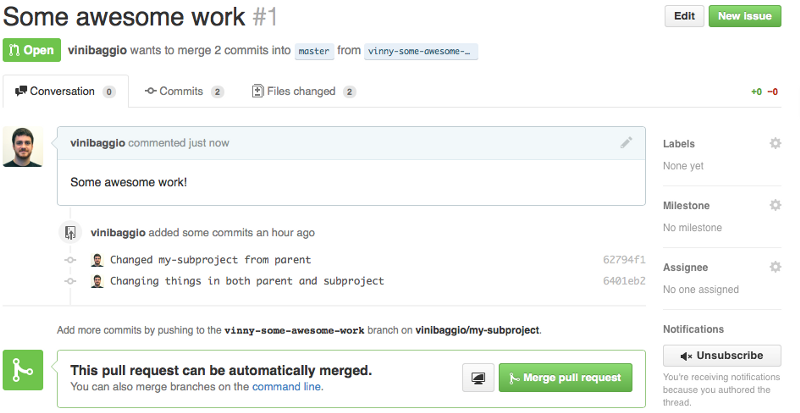 At the end, there are two commits that needs to be pushed to vinny-some-awesome-work, in the library directory. But! What happens to the other files, outside of the prefix directory? It gets filtered out. It seems everything we expected, so I merge the project. This will execute a pull, using the “subtree” merge strategy. It is necessary so we tell git to inspect the patches and identify it should be applying in a subtree of our current project (parent). Quoting the Git handbook: “it’s pretty amazing”. This is the end result of merging this branch into master. 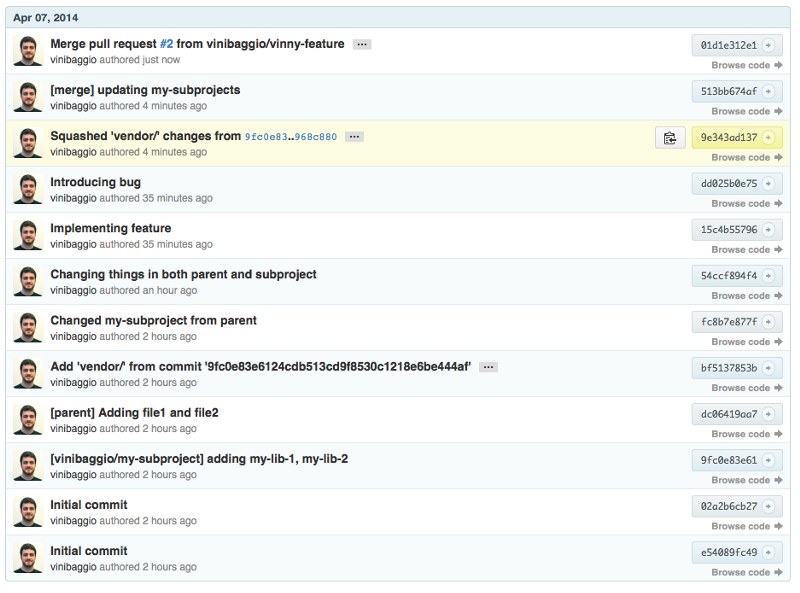 Notice the commits near the highlighted area. 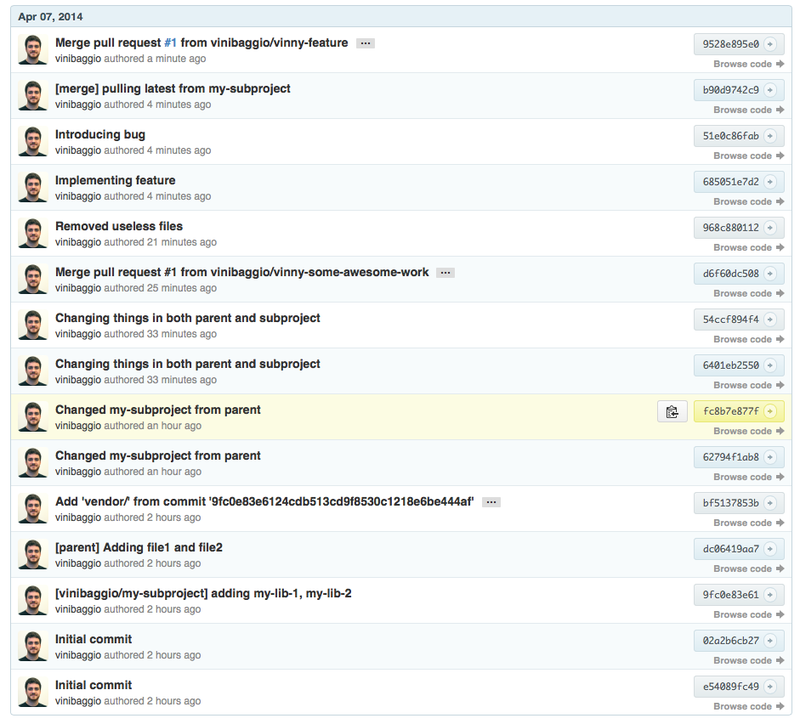 See that the commits are repeated? This is git doing its magic on the pull with subtree strategy. It will bring all the commits from the other repo and will stay together with your own repo’s versions of it. Long story short, if you pull changes, make sure you merge the commits with squash. Another good practice to avoid this repetition is to, whenever you make changes to the subprojects, make individual commits. This is not obligatory, but it will make sure there is no repetition of commit names, and also, when pushed back to the original repository, they will make sense on their own. The advantages of subtrees over submodules are mostly related to work flow. Since subtrees require no change to the project’s workflow and lack of necessity of introducing new commands, it makes the life of the developers much, much easier. Merge conflicts will make (more) sense and they’re much easier to work with. Finally, it takes a bit of time how to understand how the commands are formatted and why there are all these options, but it is very valuable, and remove the friction from all the developers of your team.